What do you need to have in place as a Startup in order to be able to successfully raise a seed round? 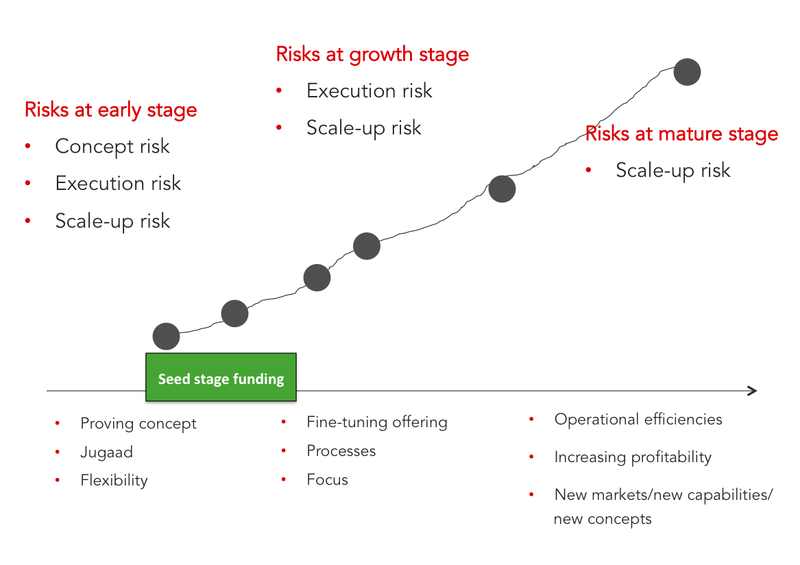 For raising a seed round, the startup should have laid the foundation to scale up, and validated most of the assumptions that would prove the business case around their concept. Of course, the basics need to be in place – the product/service needs to be good and solving a relevant problem or addressing a meaningful opportunity, the market potential should be large, the core team needs to have covered between them the key functions of that business, etc. etc. In addition to the basics, the below are some of the things that need to be in place before a seed round. Concept should have been proven: The startup’s product /service/concept should have been proven in the market. Some initial customers should have bought the product and found the value proposition meaningful. The product should have delivered on the promise. The price-point should have been proven. Also, the challenges that need to be addressed could have been identified in the pre-seed stage. The ‘business’ around the concept should be clear: In most cases, the business model is tested and adjusted and retested in the pre-seed stage. Before seeking an institutional funding, it is ideal to have tested different revenue streams, honed on to a business model that would be pursued, the price-points should have been proven and the unit economics should be positive. Validating the assumptions: Before raising a seed round, it is ideal to have tested the assumptions in the business plan (e.g. how many people will convert, cost of customer acquisition, average revenue per customer, repeat purchase rate, etc., etc.). In fact, this is the area in which startups should pay some solid attention to in the pre-seed stage of the venture. Estimating people needs: Before raising a seed round, the venture should have got a good sense of what competencies are missing in the team, and clarity on how those will be filled in (in some cases, scaling up will require someone to be hired as the CEO too). Future plans need to be in place: When you start up, you may not have the largeness of vision that will create a scale company. However, as the venture matures, and as you start thinking of an institutional round of funding, it is important for the founders to have a vision for the future and the ability to articulate this vision clearly to all stake holders (investors, employees, customers, partners, etc.). In many cases, the founders start defining or redefining the addressable market and this usually means thinking of a far larger scale than they would originally have. The team should have in place, or at the very least identified by now, the elements that they will need to put in play to manage the venture at scale. E.g. sourcing relationships or technology platform in a e-commerce venture. Jugaad to processes: As the venture moves to secure seed funding, the founders need to recognize the need to shift from a ‘fix on the move’ mode to a process oriented approach. They need to recognize that as the team grows, they will need to rely on processes and matrices and the discipline to measure performance and progress on well-defined parameters. Identify one among equals: When a few friends or acquaintances start a venture, the usually split equity equally and divide the responsibilities equally, and also designate themselves co-founders. All are therefore deemed equal, and it is possible that they are at the start. However, a ship needs ONE captain. The team has to identify a first among equals to lead the venture. Multiple power centres in a venture leads to confusion and chaos. Nett: the venture needs to be in a state where all (or at least most) the uncertainties have been dealt with (if not fully addressed) and the venture should seem like a good business case to pursue at scale. This is the time when seed-stage investors would be willing to bet on the founding team’s ability to take the initial learnings and reapply them at a much larger scale. In the process, there will be some new learnings and some new adjustments on the way. That’s the reason why the quality of the team, their passion, their ability to understand the innards of the business, etc. will be key deciding factors for seed-stage investors, even if the rest of the things mentioned above are all positive. Liked the blog-post but fell in love with the last few thoughts of advice…..of the fact is most definitely incomplete and will be growing eternally, as is the case with any successful venture. A continuity in evolvement can also be termed as ‘growth’! But certainly before the venture scales to a point to-stay…..the importance of THE TEAM cannot be enough emphasized. If an entrepreneur can relate to most of what the author has meant and said here , then he / she is probably on that right track…..but with entrepreneurship one can never ever be really sure! Also what makes it challenging, happening and worthwhile. …..of the list is most definitely incomplete…..is what was meant in my above comment. Previous Previous post: How should equity be split between founders? Next Next post: What’s typically done with un vested equity of a cofounder who leaves?